This article is about the 1936 film. For the remake, see My Man Godfrey (1957 film). My Man Godfrey is a 1936 American screwball comedy film directed by Gregory La Cava. The screenplay was written by Morrie Ryskind, with uncredited contributions by La Cava, based on 1101 Park Avenue, a short novel by Eric Hatch. The story concerns a socialite who hires a derelict to be her family's butler, only to fall in love with him. The film stars William Powell and Carole Lombard. Powell and Lombard had been briefly married years earlier. During the Great Depression, Godfrey "Smith" Parke (William Powell) is living alongside other men down on their luck at a New York City dump on the East River near the 59th Street Bridge. One night, spoiled socialite Cornelia Bullock (Gail Patrick) offers him five dollars to be her "forgotten man" for a scavenger hunt. Annoyed, he advances on her, causing her to retreat and fall on a pile of ashes. She leaves in a fury, much to the glee of her younger sister, Irene (Carole Lombard). After talking with her, Godfrey finds her to be kind, if a bit scatter-brained. He offers to go with Irene to help her beat Cornelia. In the ballroom of the Waldorf-Ritz Hotel, Irene's long-suffering businessman father, Alexander Bullock (Eugene Pallette), waits resignedly as his ditsy wife, Angelica (Alice Brady), and her mooching "protégé" Carlo (Mischa Auer) play the game. Godfrey arrives and is authenticated as a "forgotten man". He then addresses the crowd, expressing his contempt for their antics. Irene is apologetic and offers him a job as the family butler, which he gratefully accepts. The next morning, Godfrey is shown what to do by the Bullocks' sardonic, wise-cracking maid, Molly (Jean Dixon), the only servant who has been able to put up with the antics of the family. She warns him that he is merely the latest in a long line of butlers. Only slightly daunted, he proves to be surprisingly competent, although Cornelia holds a grudge against him. On the other hand, Irene considers Godfrey to be her protégé. A complication arises when Tommy Gray (Alan Mowbray), a lifelong friend of Godfrey's, recognizes him at a tea party thrown by Irene. Godfrey quickly ad-libs that he was Tommy's valet at Harvard. Tommy plays along, embellishing Godfrey's story with a nonexistent wife and five children. Dismayed, Irene impulsively announces her engagement to the surprised Charlie Van Rumple (Grady Sutton), but she soon breaks down in tears and flees after being congratulated by Godfrey. Over lunch the next day, Tommy is curious to know what one of the elite "Parkes of Boston" is doing as a servant. Godfrey explains that a broken love affair had left him considering suicide, but the undaunted attitude of the men living at the dump rekindled his spirits. During lunch, Cornelia has her longstanding boyfriend "Faithful George" (Robert Light) call Tommy away to the telephone. She takes a seat at Godfrey's table and attempts to negotiate a peace with him — but only on her terms. Godfrey declines and Cornelia leaves in a huff. When everything she does to make Godfrey's life miserable fails, Cornelia plants her pearl necklace under his mattress. She then calls the police to report her missing jewelry. To Cornelia's surprise, the pearls do not turn up when Godfrey's suite is searched. Mr. Bullock realizes his daughter has orchestrated the whole thing and sees the policemen out. After they have gone, he informs Cornelia she had better find her pearls herself, as they are not insured. The Bullocks then send their daughters off to Europe to get Irene away from her now-broken engagement. When they return, Cornelia implies that she intends to seduce Godfrey. Worried, Irene stages a fainting spell and falls into Godfrey's arms. He carries her to her bed, but while searching for smelling salts, he realizes she is faking when he sees her (in a mirror) sit up briefly. In revenge, he puts her in the shower and turns on the cold water full blast. Far from quenching her attraction, this merely confirms her hopes: "Oh Godfrey, now I know you love me ... You do or you wouldn't have lost your temper." Godfrey resigns as the Bullocks' butler. However, Mr. Bullock has more pressing concerns. He first throws Carlo out, then announces to his family and Godfrey that his business is in dire straits and that he might even face criminal charges. Godfrey interrupts with good news: he had sold short, using money raised by pawning Cornelia's necklace, and bought the stock that Bullock had sold. He gives the endorsed stock certificates to the stunned Mr. Bullock, saving the family. He also returns the necklace to a humbled Cornelia, who apologizes. Godfrey then leaves. With his stock profits and reluctant business partner Tommy Gray's backing, Godfrey has built a fashionable nightclub at the now-closed East River dump called "The Dump", "...giving food and shelter to fifty people in the winter, and giving them employment in the summer." Godfrey tells Tommy he quit the Bullocks because "he felt that foolish feeling coming along again." However, a determined Irene tracks him down in his manager's apartment at The Dump and bulldozes him into marriage, saying, "Stand still, Godfrey, it'll all be over in a minute." Eugene Pallette, Mischa Auer and Alice Brady in My Man Godfrey. My Man Godfrey was in production from April 15 to May 27, 1936, and then had retakes in early June of the year. Its estimated budget was $656,000. The studio's original choice to play Irene, the part eventually played by Carole Lombard, was Constance Bennett, and Miriam Hopkins was also considered, but the director, Gregory La Cava, would only agree to Bennett if Universal borrowed William Powell from MGM. Powell, for his part, would only take the role if Carole Lombard played Irene. Powell and Lombard had divorced three years earlier. La Cava, a former animator and freelancer for most of his film career, held studio executives in contempt, and was known to be a bit eccentric. When he and Powell hit a snag over a disagreement about how Godfrey should be portrayed, they settled things over a bottle of Scotch. The next morning, La Cava showed up for shooting with a headache, but Powell didn't appear. Instead, the actor sent a telegram stating: "WE MAY HAVE FOUND GODFREY LAST NIGHT BUT WE LOST POWELL. SEE YOU TOMORROW." Eric S. Hatch wrote the screenplay, assisted by Morrie Ryskind. Due to insurance considerations a stand-in stuntman (Chick Collins) was used when Godfrey carried Irene over his shoulder up the stairs to her bedroom. 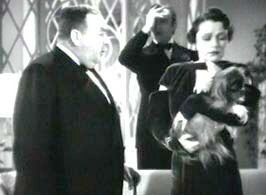 When tensions hit a high point on the set, Lombard had a habit of inserting four letter words into her dialogue, often to the great amusement of the cast. This made shooting somewhat difficult, but clips of her cursing in her dialogue and messing up her lines can still be seen in blooper reels. My Man Godfrey premiered on September 6, 1936, and was released in the United States on the 17th of September. It was a runaway hit and earned huge profits for the studio. My Man Godfrey was the first movie to be nominated in all four acting categories, in the first year that supporting categories were introduced. It's also the only film in Oscar history to receive a nomination in all four acting categories and not be nominated for Best Picture, and was the only film to be nominated in these six categories and not receive an award until 2013's American Hustle. In 1999, the film was deemed "culturally significant" by the United States Library of Congress and selected for preservation in the National Film Registry. In 2000, the film was ranked #44 on the American Film Institute's list of the 100 funniest comedies, and Premiere magazine voted it one of "The 50 Greatest Comedies Of All Time" in 2006. Rotten Tomatoes gives it a score of 100% with an average rating of 8.3/10 with the consensus: A class satire in a class of its own, My Man Godfrey's screwball comedy is as sharp as the social commentary is biting. My Man Godfrey was adapted for radio and broadcast on Lux Radio Theater on May 9, 1938, with David Niven playing the part of Tommy Gray. It was adapted again on the October 2, 1946, episode of Academy Award Theater, again starring William Powell. When the film was remade in 1957, David Niven played Godfrey opposite June Allyson, directed by Henry Koster. A stage musical version of My Man Godfrey - to be produced by Allan Carr and written by librettists Alan Jay Lerner and Kristi Kane and composer Gerard Kenny - intended for Broadway in 1985 remained uncompleted at the time of Alan Jay Lerner's death in 1986. In 2002, a restored print was made available on DVD by The Criterion Collection. In 2005, 20th Century Fox Home Video released a colorized version. The original film is generally thought to have lapsed into the public domain due to a failure to renew the film's copyright after 28 years. However the underlying work, the 1935 book 1101 Park Avenue (re-titled My Man Godfrey with the film's release), had its copyright renewed in 1963 and is thus still in copyright. According to Stanford University Library, and under rulings of Stewart v. Abend, in so-called multilayered works, the rights holder of the original work can claim ownership of the film script (though not the pictures) if the original book is still in copyright. "Films are often based on books .. that may maintain copyright. If the pre-existing work is protected, then rightly or wrongly, it has generally been determined that the derived film is also protected." ^ "10 great screwball comedy films". British Film Institute. Retrieved 2016-05-07. ^ Nemy, Enid (March 19, 1985). "`My Man Godfrey` Bound For Broadway". Chicago Tribune. Retrieved December 16, 2015. ^ Alan Jay Lerner: A Lyricist's Letters. Google Books. Oxford University Press. 2014. p. 270. ^ "My Man Godfry". Stanford University Copyright Renewal Database. Retrieved January 20, 2016. ^ "Public Domain Trouble Spots: Multilayered Works". Stanford University Library. Retrieved January 20, 2016. ^ "Films in the US Public Domain". OpenFlix.com. Retrieved January 20, 2016. Wikimedia Commons has media related to My Man Godfrey. This page was last edited on 8 March 2019, at 10:48 (UTC).